Early the following day after the adventurers freed Hammerfist Hall from the icy rule of the Winter Witch, Felmor—Clanlord Farsten Hammerfist’s Chief Miner—sent a crew of eight dwarves down to inspect the mines of Durom Deep’s more isolated shafts. But by evening, Felmor’s crew had failed to return. A rescue team under the leadership of Felmor’s experienced crew chief Gairg was sent into the mine to recover the missing dwarves. But by the time the sun had risen, it was apparent that they, too, had gone missing. Though no trace has been found of either group, searchers discovered tracks that they believed were left by drows. Now, Felmor’s workers grow wary. Fearing some dark horror lurking within the ancient mine as well as the presence of drows, many of of the dwarves refuse to return to Durom’s Deep. In need of help, Felmor seeks the aide of the adventurers to discover the fate of the missing workers, and to rid the mine of the unseen threat that claimed them. The clanlord raised his jeweled drinking cup in homage to the guests seated around the great table. Others dwarves also raised their cups and cheered for the heroes of Hammerfist Hall. For the next two days, the sights and sounds of jovial celebration was seen and heard throughout the dwarven stronghold. Bards recited epic sagas of past heroic deeds, while adding a new tale of an unlikely group of heroes made up of two drows, a dwarven tower guard, an elf, a lich, and a gnome, who by might and skill helped free Hammerfist Hall from Koliada, the Winter Witch. But as all good things must eventually come to an end, so did the festivities see its last song sung and its last ale or mead drunk. Clanlord Farsten Hammerfist ordered the festhall cleared in preparation for a meeting to plan out an alliance with those from the Sunset Vale. It time, all was made ready for the meeting. Zaachaeus, regent of Bear’s Head, a town in the western part of the Vale spoke at length of forming a confederacy in the Vale. The confederacy would allow for an alliance of military forces as well as paving the way for each member of the confederacy to trade freely with each other. The drow regent suggested that a central meeting place in the Vale be chosen. Permanent teleportation circles would be placed at the meeting spot where the respectful leaders could meet at a designated time. Zaachaeus also mentioned he and his friends’ plan to assault the Zhentarim keep of Darkhold. He suggested that once Darkhold was captured, forces from both Bear’s Head and Hammerfist Hall would occupy it and ensure the safety of the northern Vale and the northern Sunset Mountains. Satisfied with the suggestions, Clanlord Farsten said he would would discuss the terms with his council before making a decision. Before leaving, he invited the group to remain and enjoy the food and drink. After the Clanlord left, four dwarves entered the feast hall and challenged everyone to a drinking match. Most participated in the drinking game. In the end, it was a dwarf named Fendar Alehole who bested everyone. Suffice it to say, with a dwarf’s clan name being “Alehole”, how can anyone best him in a drinking match? The next day, the group was led by three dwarven guards into the mines. 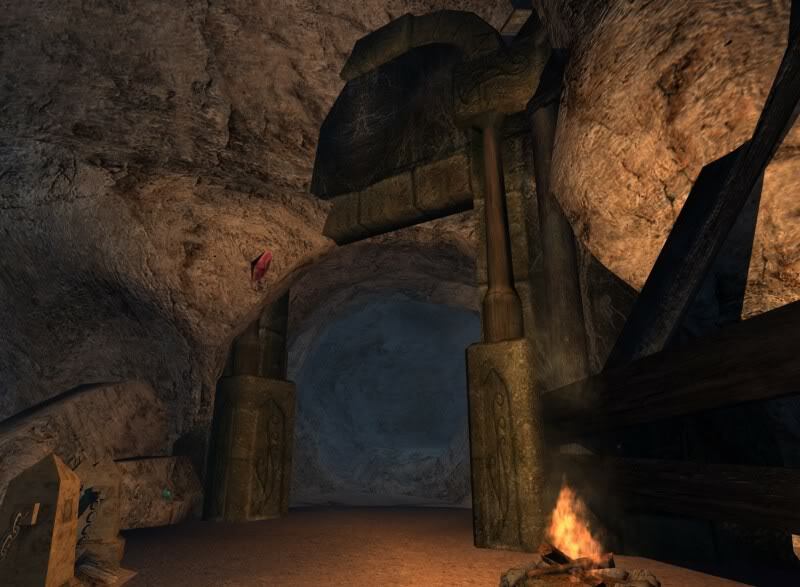 A teleport circle within the stronghold allowed the group to quickly make their way to the mines. Upon their arrival, the adventurers discovered a mine full of tools, ore carts, and minecart tracks leading deeper into the Underdark. The guards informed everyone that since their release from the clutches of the Winter Witch, dwarven miners have been hard at work repairing and getting the mines operational again. But now, with the dangers at hand, the work has been put on hold. 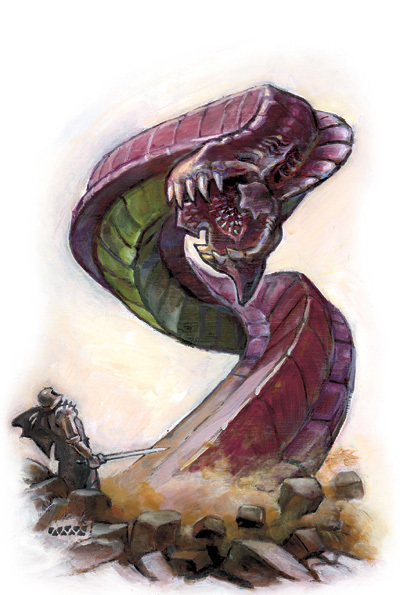 As the group made their way deeper into the mine shaft, a huge Purple Worm bore through the ground and attacked the party. A battle ensued in which the group killed the Purple Worm. Despite a tough battle, no one was seriously injured. The dwarves shared with the party, that the Purple Worm they had just slain was none other than Drengi, Slayer of Miners. For years, Drengi had claimed the lives of many miners. Although the Clanlord had sent fighters to seek and slay the great worm, no dwarf had been able to kill it. Impressed with the party’s prowess, the dwarven guards led the party deeper into Durom’s Deep in search of the lost miners. After searching several nearby tunnels, the group came upon a surprising sight. Several dwarves—the lost miners they were looking for—came stumbling out of a partially collapsed tunnel. When asked what happened to them, the dwarves said they were attacked by Drengi, the Purple Worm. They managed to escape but were trapped in a cavern after a tunnel they came through collapsed, possibly caused by Drengi’s attack. Unfortunately, some of the miners didn’t survive the attack. Satisfied that they had done all they could, the adventurers returned to Hammerfist Hall. In the great dwarven halls of Hammerfist, Clanlord Farsten greeted the adventurers as heroes once more. He also explained that the adventurers just missed seeing a trio of giants who came to speak with him. The giants bore a message from their clans announcing the return of giants to their ancestral homes in the Sunset Mountains. In particular, the giants announced the capture of Darkhold by their forces. It seemed that Darkhold once again belonged to the giants, as it was in ancient times. Clanlord Hammerfist went on to relate how vague the giants were when he asked where their strongholds were and who their leader was. Despite that, he had agreed to leave the giants in peace. In return, they offered to leave the Hammerfist Dwarves in peace. With news of a large storm threatening the area, the group decided to stay in Hammerfist Hall for a while. Zaachaeus later met with Clanlord Hammerfist. In return for raw stone quarried from the Sunset Mountains, he offered the kingly sum of 100 astral diamonds (one million gold pieces). He said the materials would be used to build roads and for other projects he had planned for the Western Vale. With the transaction made, the Regent of Bear’s Head, along with his fellow adventurers returned via a magical portal back to Bear’s Head. All thoughts of assaulting Darkhold had ended with the news of the giants’ return to the Sunset Mountains. Here ends the “Assault on Darkhold” story arc.